WARWICK, N.Y. (July 9, 2018) - Diagnostic Cardiac Services at St. Anthony Community Hospital, a member of the Westchester Medical Center Health Network (WMCHealth), has been granted accreditation for a three-year term by the Intersocietal Accreditation Commission (IAC) in Echocardiography in the area of Adult Transthoracic. IAC accreditation is a seal of approval that patients can rely on as an indicator of consistent quality care and a dedication to continuous improvement in the facility in which they’re being evaluated. Echocardiography is used to assess different areas of the heart and can detect heart disease or signs of serious conditions. An echocardiogram (also called an echo or cardiac ultrasound) is a painless test that uses soundwaves to take moving pictures of the heart. It shows the size and shape of the heart and how well its valves and chambers are functioning. Echocardiography does not use radiation and it is one of the most widely used and common diagnostic tools in cardiology. A physician may refer a patient for an echocardiogram when symptoms of heart problems, including heart failure, murmurs and other conditions, are present. There are many factors that contribute to an accurate echocardiographic diagnosis. Some of these include the training and experience of the sonographer performing the procedure, the type of equipment used and the quality assessment metrics the facility is required to measure; all which contribute to a positive patient outcome. This latest accreditation awarded to St. Anthony Community Hospital demonstrates the facility’s ongoing commitment to providing high quality patient care in Echocardiography. Accreditation by the IAC means that St. Anthony Community Hospital’s Diagnostic Cardiac Services has undergone an intensive application and review process and is found to be in compliance with the published IAC Standards thus demonstrating a commitment to quality patient care in echocardiography. Heart disease is the leading cause of death in the United States. According to the American Heart Association (AHA), more than 2,150 Americans die each day from cardiovascular disease which amounts to about one every 40 seconds. Consult your physician to inquire more information on an echocardiogram referral or for information on the diagnostic services offered through St. Anthony Community Hospital, please call 845.987.5147. 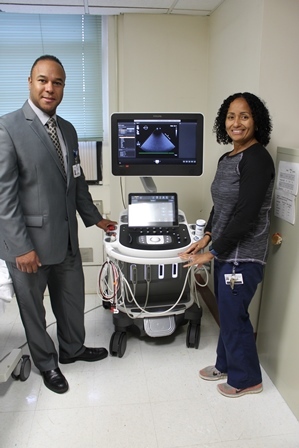 Photo Caption: Edgar Perez, MBA, RRT, Director of Respiratory Services, and Brigida Hershberger, Lead Echo Cardiac Sonographer at St. Anthony Community Hospital.